I love it when function and form come together to create something special that can add to the collective conscious in a fun and memorable way - and this year, The Coleman Company has stepped up in a big way and introduced a limited edition blue lantern in support of Autism Speaks and the Light It Up Blue campaign that ! 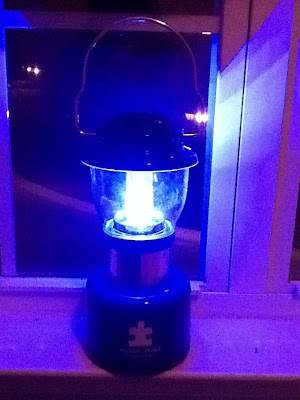 As an Autism parent, I love to be able to wear my heart on my sleeve and proudly proclaim my Autism Mom status - I wear a lanyard around my neck with my keys on it that says Autism Awareness, carry bags with autism related logos, so why not add a fun lantern to our camping collection! I love that the lantern offers the special blue light option, but also throws out great white light for reading or walking through the woods! I know that this lantern is going to be a conversation starter when Wayne takes the kids camping later this spring - how can it not be, right? Like all of the Coleman products that I've used over the years, this lantern is sturdy and well crafted, meaning that we'll be able to use it to Light It Up Blue for years to come, for camping, for power outages and it will be living with our emergency preparedness kit when we aren't packing it for the long haul! And I know that it's sturdy - my two year old destructive genius has already had his hands on it - and it's still working! But seriously... you can only get this special-edition lantern, powered by a Cree LED that 200 lumens of light on its high setting in two ways: It retails for $24.99 and is sold exclusively through Coleman.com and only while supplies lasts (through the end of April) OR you can win one here on Acting Balanced! Disclaimer: I received this product at no cost for review purposes. All opinions are my own!